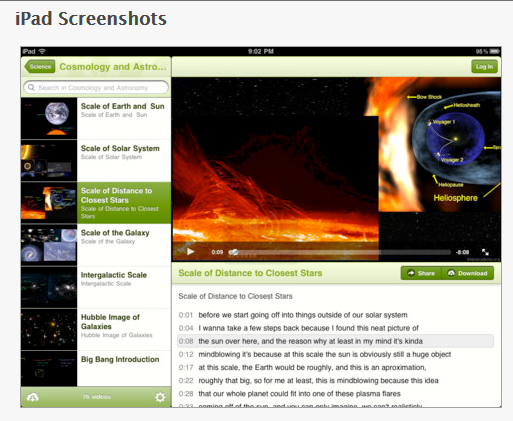 Khan Academy App for iPad is available, for free! Never heard of the Khan Academy? May be if you are an OT and work with young children that certainly might be true, however if you are an OT who works with middle or high school students with learning disabilities, Khan Academy may be something you might want to be familar with. The Khan Academy allows you to learn almost anything for free. Their iPad app is a great way to view Khan Academy’s complete library of over 2,700 videos on topics, including K-12 math, science topics such as biology, chemistry, and physics, and even the humanities with playlists on finance and history. It provides background knowledge using video presentation to students participating in core curriculum activities. Many of our students, whether learning disability or high functioning individuals with autism need background information in specific areas. Watching, listening and being able to review the information multiple times can be a study tool for them. This may not be an app for everyone’s OT iTool Kit, but if you work with middle and high school students and need a review of math concepts for the student or yourself (how can you help adapt or modify when you can’t remember how to do the math? ), or prior knowledge, this is a great resource. Khan Academy also is a Web 2.0 resource and can be added to your arsenal of video resources along with others as Watch.Know.Learn Web 2.0 video collections. Worth checking out? How can you beat free? This entry was posted in High School, iPad, Middle School, Occupational Therapy, Uncategorized and tagged App Review, iPad, Learning Disability. Bookmark the permalink. I am familiar with Kahn Academy and have watched a few lessons. Although not for all students, I do like how it is free, very straight forward and great for review. I have shared this site with many parents – hard to help with math homework if you don’t remember how to do it in the first place. I find it GREAT for homework help….a free tutor in my eyes that is always available. There are many more video based lessons coming online with the growth of flipped classrooms (which is also an interesting concept but that is for another post).